Extension modules can be used to add your own form processing features to your form. You want to save the form submission data to a more complex schema of tables in a database. An extension module is written in PHP. You should be familiar with the syntax of PHP to write extension modules. Your extension module should extend FM_ExtensionModule class. You can override the functions of FM_ExtensionModule and do custom handling. The functions of the extension module are called at specific points of form processing. For example, the function BeforeFormDisplay() is called just before displaying the form; the function FormSubmitted() is called after the form is submitted and data is validated. The code above loads a field 'Name' with a default value. To see this code in action, put the code above in a file (say mymodule.php) Then Enable 'extension modules' in the 'Form processing options' page, and add the file in the 'Extension Modules' page. The field "Name" will have the value "Default Name" when the form is loaded. Of course, you can have more complex logic in your extension module. The Function Reference contains the list of all the functions that you can override in your custom module. In Simfatic Forms, first enable extension modules in the Form Processing Options Page. 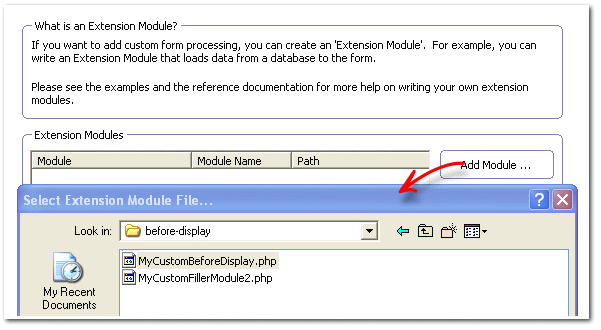 In the 'Extension Modules' Page you can load your extension modules. Press the 'Add Module' button and select the file that you have created. The base class for the extension modules - FM_ExtensionModule class contains certain useful member objects. To log an information message, call LogInfo() . To handle a critical error case in your extension module, make a call to the error_handler object. There are some sample Extension Modules in the Simfatic Forms Installation folder(usually "C:\Program Files\Simfatic Solutions\SimfaticForms" ). Open the sub-folder "scripts\server\ExtensionModuleSamples". You will find some sample extension modules. The same folder contains some form template files as well. These sample modules will serve as a good starting point. you can download and customize any of those custom modules!